Angel Rangel says Swansea's remaining five games are a chance for players to prove they deserve to be at the club next season, and in the process secure a record Premier League points tally. Swansea are on 47 points, a mark they last reached in the 2011-12 season. Saturday's 2-0 loss at Leicester delayed setting a new record. "We still have a lot to fight for. We want to prove that we want to be here next season," said defender Rangel, who signed a two-year contract last month. "We've had a few injuries and now the ones who have a chance to play have to prove themselves. "So we've still got the chance to make something special this year, it's been a great season and I think we demonstrate... we have a lot to play for. "We're in a privileged position, I think there's 12 teams below us who'd love to be in our position so it would be stupid of us to think that everything is finished. "Our motivation is to go as high as we can, so we have to be professional at the end of the day. "Not that many years ago we were in the lower divisions and now we have the chance to finish in the top 10 - hopefully eighth - of the Premier League." 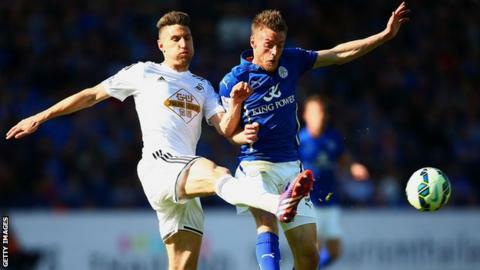 Swansea went to the King Power Stadium without several players because of injury, including in-form striker Bafetimbi Gomis and defender Kyle Naughton, and came up against a Leicester side scrapping for survival. "We played against a team that was bottom of the table but they played some good, positive football and we couldn't cope," admitted Spaniard Rangel, who has been restored to the Swansea line-up since Naughton's injury. "We have to move on now and hopefully in the next game against Newcastle we can grab some points." After Saturday's trip to Newcastle, Swansea have games against Stoke, Arsenal, Manchester City and Crystal Palace to follow.